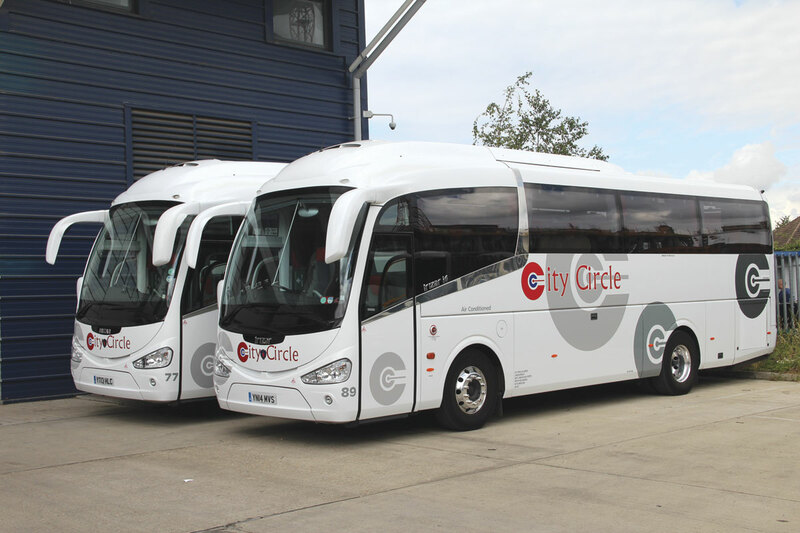 City Circle UK Ltd has acquired 21 new coaches for this season and is evaluating some others, among them the first Euro6 Scania tri-axle with Irizar i6 coachwork. B&CB was keen to see how the new Scania performed and accepted the offer of City Circle UK’s MD, Neil Pegg, to visit their London facilities and talk to him and members of the staff about the coach, the process that has led them to consider it, how it compares with other coaches they operate or have operated and how it is performing, as well as taking it out on the road briefly to see for ourselves what it is like. 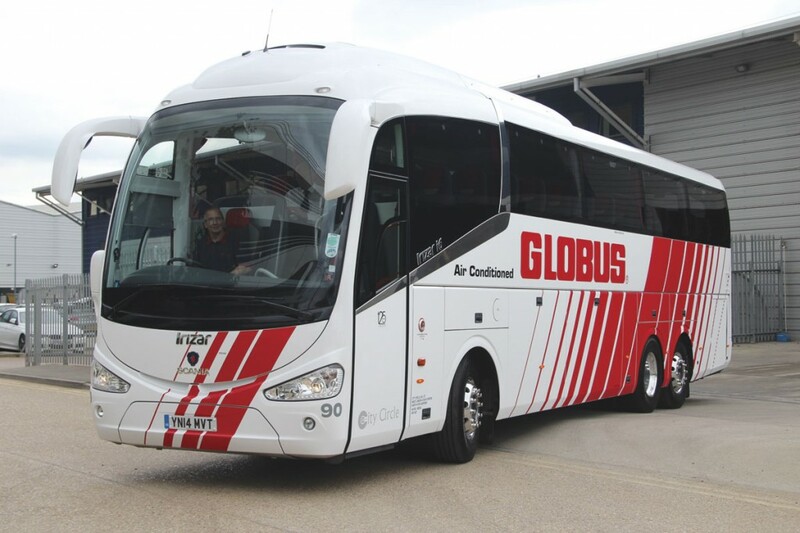 Getting to see it proved something of a challenge as it is fully employed on Globus UK and Irish tours of between four and 22 days and carries their red and white colours. Passengers are predominantly Americans and Australians with lots of luggage. It only returns to London between tours and so a couple of Tuesdays ago I headed south to see it after it had received its six-weekly service at Scania’s Heathrow facility the previous night. 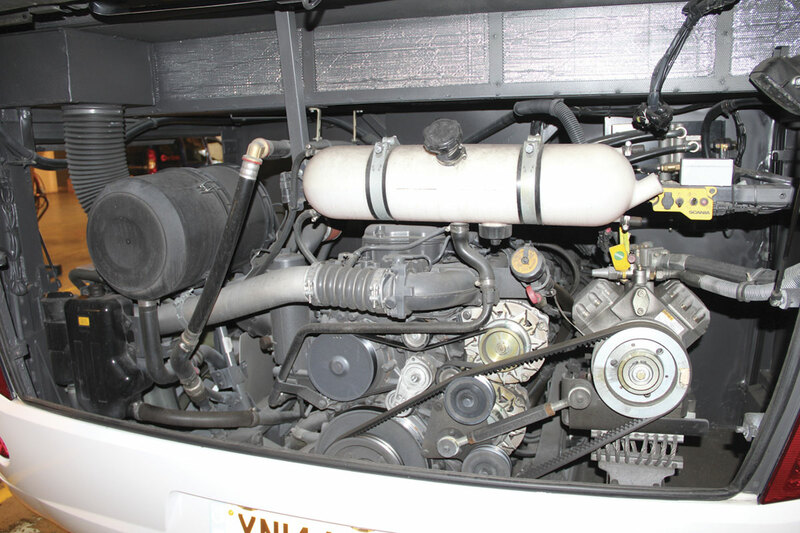 Most manufacturers have opted to use both selective catalytic reduction (SCR) and exhaust gas recirculation (EGR) to control the engine emissions at Euro6. At Euro5 only Scania and MAN went down the route of meeting the regulations using EGR alone; the benefit being that there was no need to use AdBlue. It was therefore slightly surprising that for Euro6, Scania opted to offer two SCR only solutions for coach use with no EGR, thereby saving on both weight and complexity. 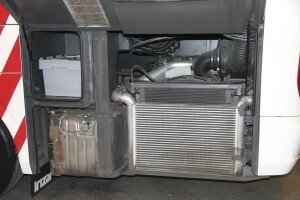 The two non EGR alternatives are the 360hp in the two-axle K360 and the 410hp engine in the three-axle K410, which is the model that City Circle UK are trying. It is 12.9m long and 3.95m high over the air conditioning pod. It has 53 reclining seats and a centre sunken toilet. Talking to Neil, he explained that it is a business with a strong but not exclusive allegiance to the Neoplan brand having started with six of the marque and bought more at regular intervals since, with the total now standing at 65. Of the 58 coaches run today by the company’s twin operations in London (34) and Edinburgh (24), some 41 are Neoplan Tourliners. Nothing operated is older than an 11-plate. Neil says he has always been fundamentally happy with Neoplan. He likes the fact that it’s a German integral, albeit built in Turkey, and is positive about the specification, build quality, performance and the overall package. 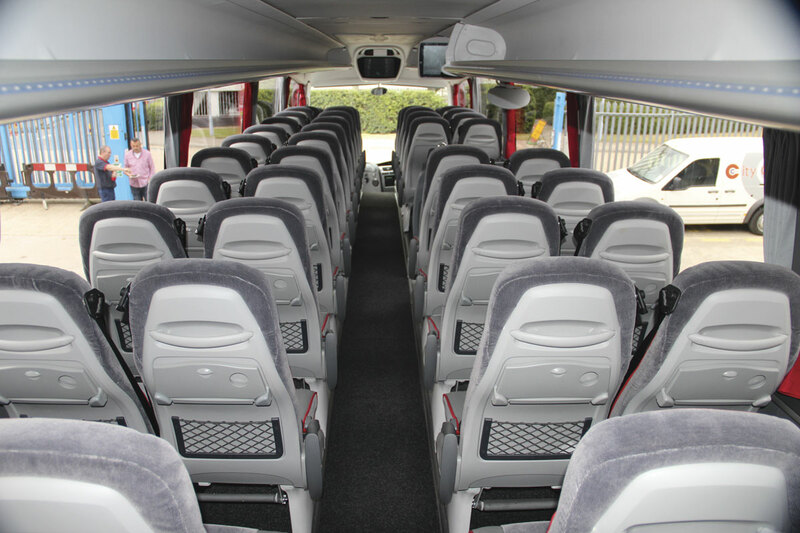 Batches of other full sized coaches have been bought including Setra S315GT-HD and S415HD, Volvo B12 Jonckheere JHV, Mercedes-Benz Tourismo and short Van Hool T9s. 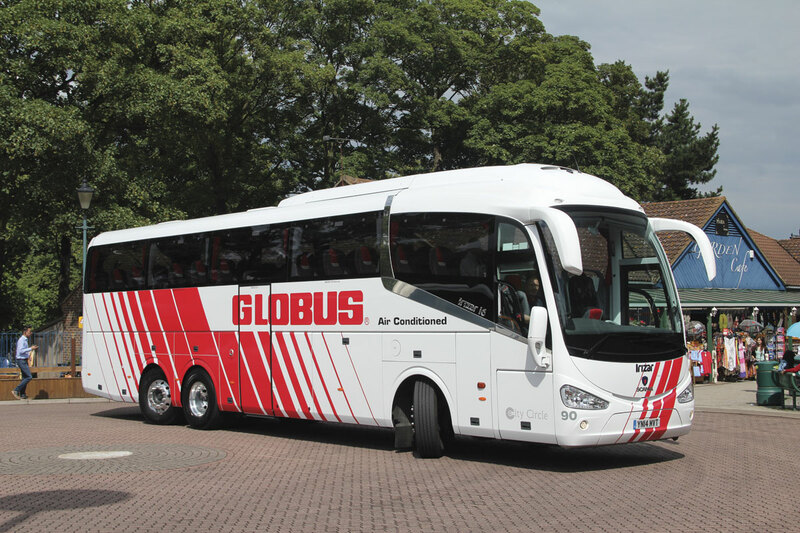 Neil explained that at the beginning of 2013 the Globus contract had been taken on from another operator who had been scheduled to take a 12m two-axle Scania K400 Opticruise Irizar i6 with 49 seats and a toilet. 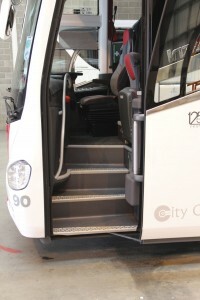 City Circle UK agreed to take this coach on and operate it. ‘Through the whole seven month season it never missed a beat on UK tour work, returning 11mpg over the summer,’ said Neil. ‘Whilst it is important that any vehicle we purchase must be competitive in terms of fuel, running costs, build quality, back up and passenger appeal, the overriding factor is the way the deal is structured,’ said Neil. 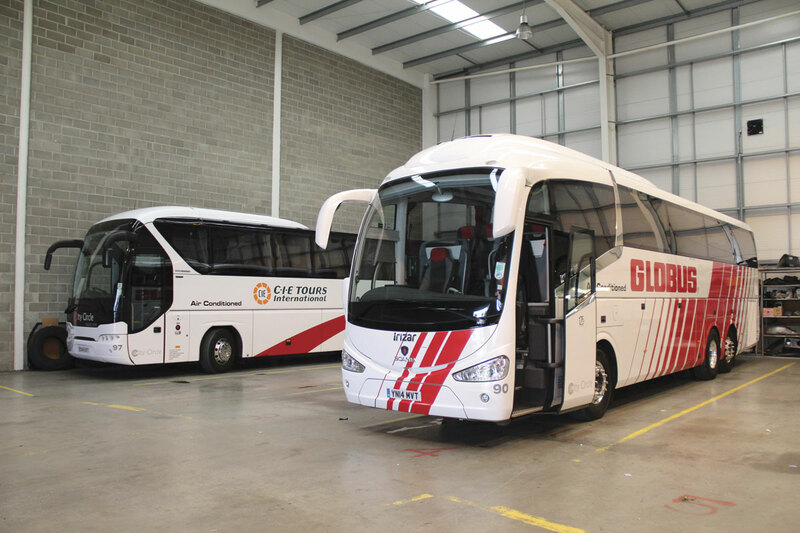 Whether they will go more heavily down the Scania route remains to be seen, but on the basis of what they have seen so far, the coach is now a very serious contender for City Circle UK’s business in a way that previous generations of Scania Irizar were not. 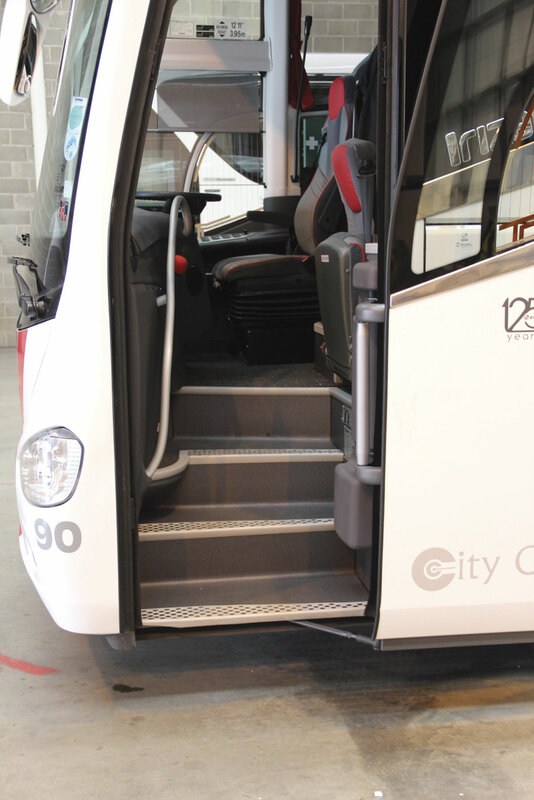 Neil has already described many of the features, but to recap briefly, the well appointed Irizar i6 body is 12.92m long, and nominally 3.7m high, though this increases to around 3.95m when the Hispacold air conditioning unit is taken into account. It meets the enhanced ECE R66.01 rollover requirements that become mandatory in 2017. The 12.92m model is the shortest of three tri-axle options, with 13.87m and 14.98m variants also offered. 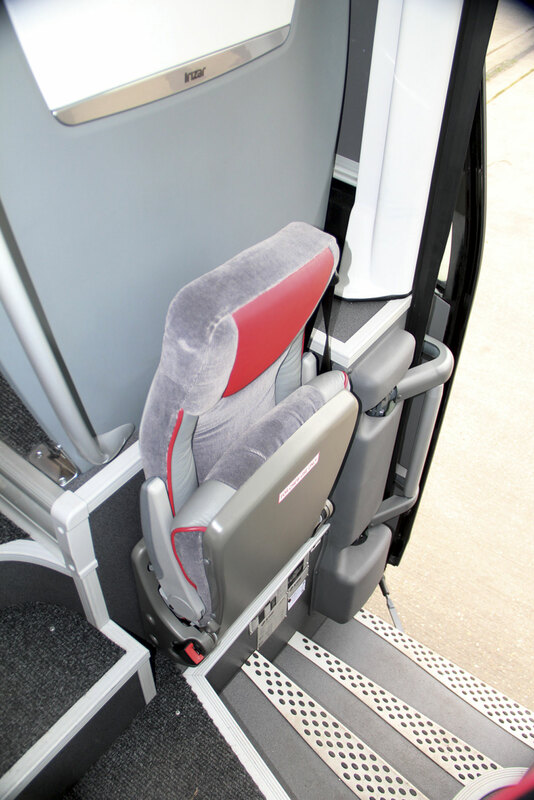 As tested it had 53 Irizar i6 seats with externally mounted three point belts, individual footrests, magazine nets, folding trays with drinks cut-outs, horizontal handles, red leather headrests, grey leather seat panels with a grey cloth centre area and plastic finish rear sections. Full curtains, alternately red and grey, are fitted along with grey sidewall casings and black rubber sills. Full length open racks run along both sides of the saloon with a gap in the offside unit to account for the continental door and for the mounting of the second monitor. Two roof hatches are included. An AD Systems drinks unit was mounted above the toilet top. The continental door is centrally mounted with the toilet alongside and has five demanding steps from the ground to the sunken aisle. Handrail provision in this area could be improved, though at the main entrance it is good. The cab features an Isri 6860 driver’s seat with three point belt, safe box and lumbar support and there is a courier seat. Mounted in the front dash is a top loading fridge and there is a centrally mounted integrated front monitor as well as an illuminated fasten seat belt sign and a clock, though this was covered over as it needed replacing because it was gaining time. Mechanically, it features the Euro6 Scania DC13-115, 12.7-litre, 410hp engine, which has SCR but no EGR system. 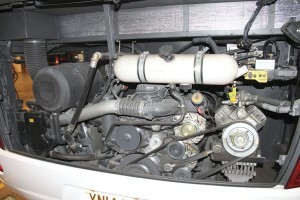 This is the same capacity engine employed at Euro5. Peak torque is 2,150Nm at 1,000-1,300rpm and the maximum power of 410hp is produced at 1,900rpm. The transmission is the Scania GR875R eight-speed fully automated two-pedal unit with Opticruise gear shift control and K432-62 clutch plate. 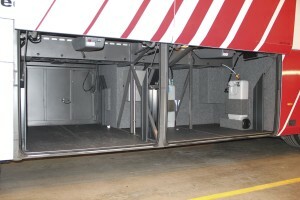 Independent front suspension is employed at the front while at the rear the bogie incorporates the ADA1300 drive axle with a 2.73 ratio and the ARA860 steered tag axle. Power steering is the ZF8098 recirculating ball system. There are twin 150A alternators and 225Ah batteries. The digital tachograph is the Stoneridge SE5000 Exakt Duo two man unit. 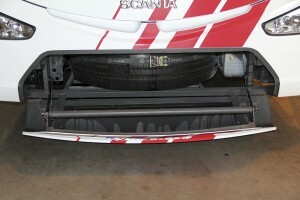 The fuel filler for the 567-litre tank is located to the rear of the front wheels, while the 80-litre AdBlue tank is behind the rear offside wheel. It runs on Alcoa Durabright 22.5-inch alloy wheels on each axle. These are equipped with Michelin 315/80R22.5 tyres. The unladen weight of the coach is 16,873kg. 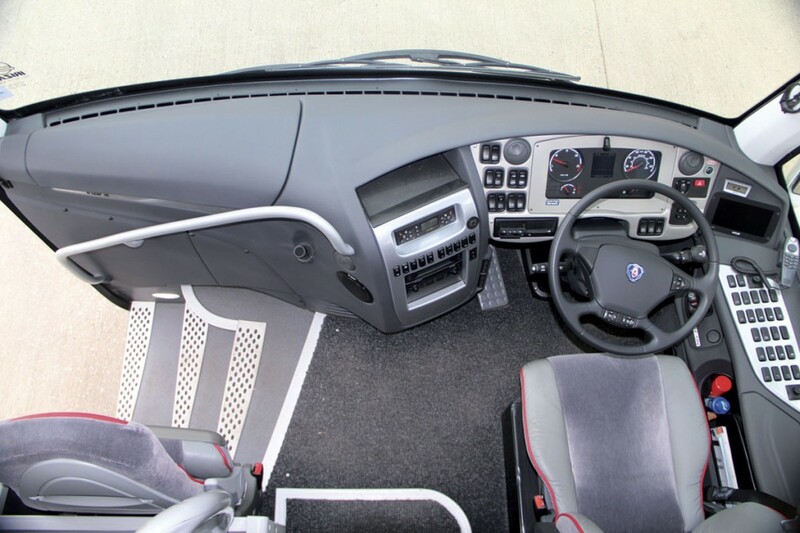 Given Neil’s comments, it is worth noting that in comparison, the longest two-axle Irizar i6 option Scania offers is the 12.45m model, which accommodates 53 seats and a toilet. 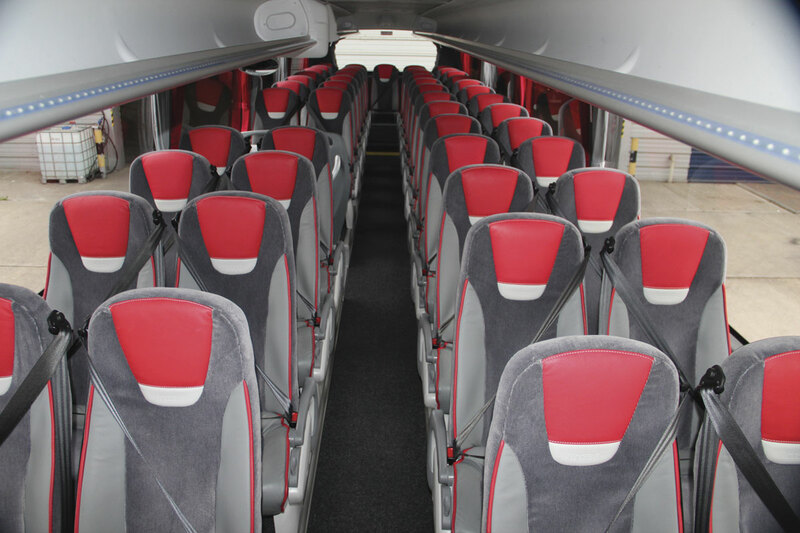 Powered by a 360hp nine-litre unit which is also SCR-only, it weighs around 13,460kg depending on specification, Irizar having managed to save around 240kg in comparison with the Euro5 version. Driving the Scania for the season is James Gibson, who last year drove one of the Tourliners. He was formerly with the Gibsons of Moffat family concern. 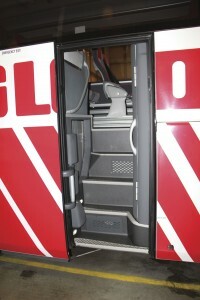 Asked about the coach, the first thing he mentioned was the steepness of the centre door steps, saying, ‘A lot of people comment that it’s a long way down, but then it’s a high motor so you’ve got to compromise.’ He believes it may also be the triangular cut-out in the penultimate step that puts people off. ‘The luggage compartment is good. I like it that way. You can get cases five or six high which is better than the Neoplan. 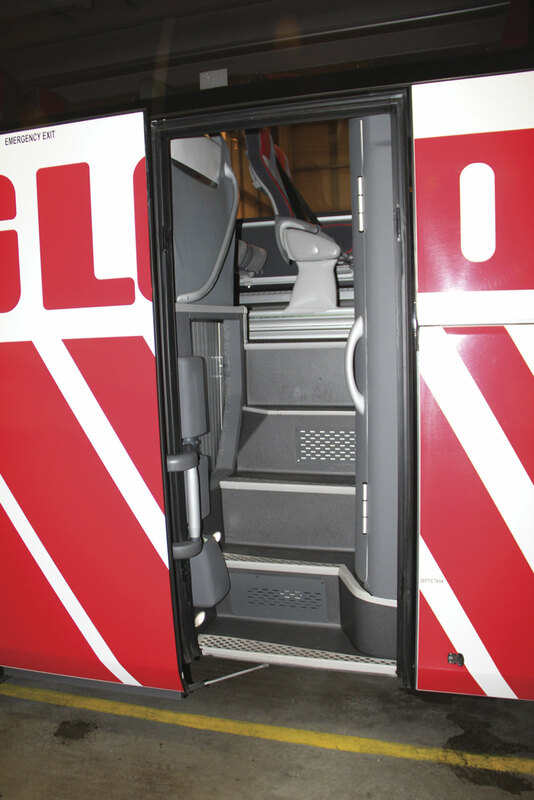 If they lifted the floor four or five inches in that it would be better.’ He also pointed out that powered locker doors were standard on the i6 whereas they weren’t even an option on the Neoplan. So far, none of the passengers have made a comment about the saloon, nothing good or bad, except about the centre door. People say more positive things about the seats in the Neoplan, which have additional support. They’ve not mentioned this.’ He liked the white material used to trim the ceiling. 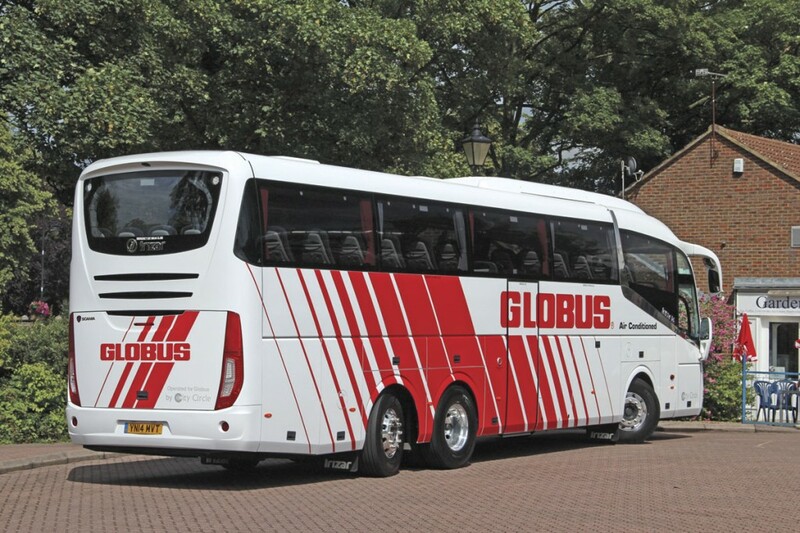 When Neil said that there had been complaints last year from guides on the Neoplans, James said that they liked the Scania i6 compared to the PB and the Century. After talking to Neil and James, I went out in the coach with Engineering Manager, Steve Maw, at the wheel, and newly appointed local Scania representative, Richard Polley, accompanying us. 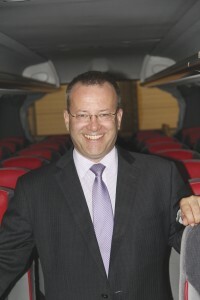 Richard should know the strengths and weaknesses of the Scania and the Neoplan as he previously represented MAN/Neoplan. We took in some local roads, motorway stretches and a bit of town driving as we called at Windsor Coach Park for a spot of photography. We were a bit short on hills, and certainly couldn’t find anything long and arduous to experience what James had mentioned, and the vehicle always felt as if it was on top of the job. Visibility was, ‘good to very good, with a crisp clear line of vision down the side of the coach.’ Sat in the driver’s seat Steve lost his view of half of the blind spot inset mirror and a third of the main mirror, though he pointed out that there was a mirror below the side window that covered the missing area. James was not keen on the additional mirror because it was vulnerable and Steve said you had to watch it on the continent to avoid catching pedestrians’. The Neoplan doesn’t have one. James hadn’t referred to it, but something Steve didn’t like was that, having adjusted the wheel to a comfortable position, he could not easily see the arc of the speedo between 30 and 70mph. ‘I can see it up to 30mph but after that you’ve got to make a physical effort’, he said, adding that scope for adjusting the wheel was limited because you couldn’t lock it exactly where you wanted it. ‘From an engineering point of view it’s the wrong place to have the switches next to an open window because the rain can get in and the driver could knock his tea over, but from the driver’s point of view it is much better than having them all over the dashboard.’ Steve thought it sensible having all of the chassis/driving controls grouped together and all of the saloon related items grouped together separately. He disliked the complexity of ‘what they try and cram into the heating control unit’ though Irizar is far from alone in this respect. He’d have preferred an on/off switch ‘like that on a Leyland Leopard’. ‘Most drivers set it to auto and leave it, but sometimes passengers ask for a change. With the reflection you can’t see the screen,’ he said. The steering was light and precise yet sensitive, picking up ruts in the road a bit more than the Tourliner, Steve thought. At the same time, it was more precise and responsive at lower speeds because of the steered back axle. ‘It comes round rather than you dragging it,’ he said. The braking was fine with quite a gentle retarder that stays smooth and progressive, even if you give it two or three clicks at once. In an effort to give an impression of how the vehicle drives we noted the (approximate) revs it was doing at various speeds. At 30mph it was recording 1,500rpm in fifth or 1,100rpm in sixth and once sixth was selected it didn’t change down to fifth again until you went below 25mph. At 40mph, it was doing 1,400rpm in sixth/ 1,100rpm in seventh, and moving up to 50mph it would hold around 1,300rpm comfortably in seventh, labouring slightly if you tried to hold it in eighth on an incline though it was comfortable on the flat. At 60mph it indicated 1,300rpm in eighth and at 62.5mph/100kph it rose to 1,350-1,400rpm. I thought it comfortable to travel on, and also noticeably quiet, with the exception of those indicators which can be heard from the back seat. There were only a few minor body points I spotted. It was difficult to see the centre monitor from some seats near the back because the rack obscured it, and the window seats in the back row had limited recline compared to the three centre seats, though shoulder room was more generous than on the PB. Something that surprised me, and something that could easily be altered, is how strong the springing on the toilet door is. I’d have thought a frail person would struggle to open it. The appeal of the i6 is that it is light, simple and stylish. City Circle UK’s colour scheme perhaps wouldn’t be my choice, I find the bright red a bit brash and I’m not that fond of grey on the seats either with so much of the rest of the interior in that colour, but I do know from other coaches I’ve seen and a tour of Irizar’s new customer centre that you can create pretty much whatever look you want for the i6. ‘In common with all of the other Scanias we own, it is fitted with the FMS (Fleet Management System) monitoring system and I get a weekly report on what it has done,’ Steve revealed. He presented to me the printout which showed that over its first 22,000km it had averaged 9.7mpg, a figure Steve anticipated would improve once it had topped the 30,000km mark. 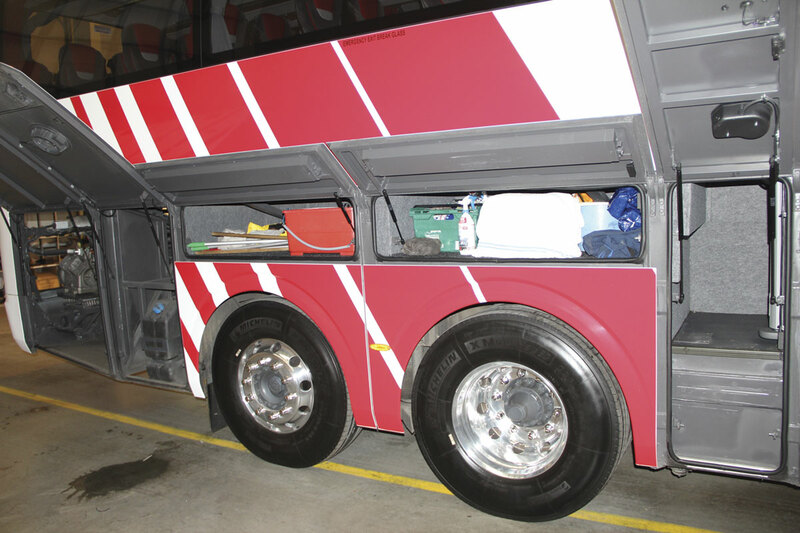 He noted that five of the MAN Tourliners had been in for EGR rail replacement and a further four were being monitored because the EDC light had come on, which was potentially the first sign of EGR failure or a fuel restriction. He commented, ‘The problem is that you don’t have on board diagnosis, you just get a warning light and a pictogram but nothing to help the driver. The Scania has diagnostics which is a big step forward. You can make a decision over the telephone about whether a driver can continue or not. You don’t want to be responsible for consequential damage for ignoring a warning light.’ Steve thinks all manufacturers should give a fault code in addition to a warning light so that the driver can give some details over the phone. The Irizar i6 bodied Scania K410EB 6×2 is a good looking coach that does a lot to attract passengers and to my mind the build quality shows the advances the bodybuilder has made in comparison with the PB model. It is well supported in the UK and has the benefit of a pan-European support network too, an important factor for the kind of work a coach such as this is likely to undertake. There should be an advantage in not having EGR in terms of simplicity, as well as a saving in weight, though this is far less critical on a three axle coach than on a two axle, where it can have capacity implications. If you do want additional power you can currently specify the 450hp Scania DC13-124 12.7-litre engine which gives you torque of 2,350Nm at 1,000-1,300rpm or the DC13-125 which gives you 490hp at 1,900rpm and a huge torque figure of 2,550Nm at 1,000-1,300rpm. Both of these units have EGR as well as SCR; whether you feel you need to make the additional investment will depend on the work you undertake. Scania has recently announced an SCR only version of the 13-litre engine rated at 450hp for truck applications, which is expected to become available for coaches early next year. Like the SCR+EGR version, it gives torque of 2,350Nm at 1,000-1,300rpm which should address any perceived power shortfall. Retail prices for the 12.9m Scania K410EB 6×2*4NI with 3.95m high Irizar i6 coachwork start at £275,000.